As evidenced by these many deformities and deficiencies, Juvenile Blount’s Disease is no longer a simble tibial vara. The varus itself has multiple components and is associated with flexion deformity of the knee due to the relative growth arrest occurring with the tilting of the plateau and internal torsion of the tibia. The tibial torsion occurs when normal growth of the fibula causes a crankshaft phenomenon, rotating the tibia. This causes slowing of the growth of the tibia leading to a limb length discrepancy. Furthermore, the femur attempts to compensate the varus deformity by growing into valgus. With all of these components, it becomes much more complicated to treat Juvenile Blount’s Disease. All of these components will need to be addressed. At the Paley Institute, we are on the lookout for every one of these components of the deformity. We therefore obtain the necessary long biplanar x-rays either using erect leg stitched radiographs in the office or 3D radiographs using the EOS scanner that is next to our office in the hospital. We will often get MRIs to look at the status of the growth plate and see whether it is still functioning or if there is a bony bridge across the growth plate. This also shows us the thickness of the cartilage and its status inside of the medial epiphysis of the tibia. We will measure the joint orientation angles determining whether there is any compensatory valgus of the femur present and will measure the sagittal plane to see if there is any flexion deformity present. Through examining the patient, we will determine if there is any rotational deformity and in some case we will also obtain a CAT scan to quantify that rotation as well as to look at the intra-articular anatomy of the knee joint. Armed with this information, we will then develop a treatment plan to correct some or all of the deformities depending on each situation. Therefore, each patient is treated in a customized fashion. Intra-articular hemi-plateau elevation osteotomy with or without closure of the growth plate. 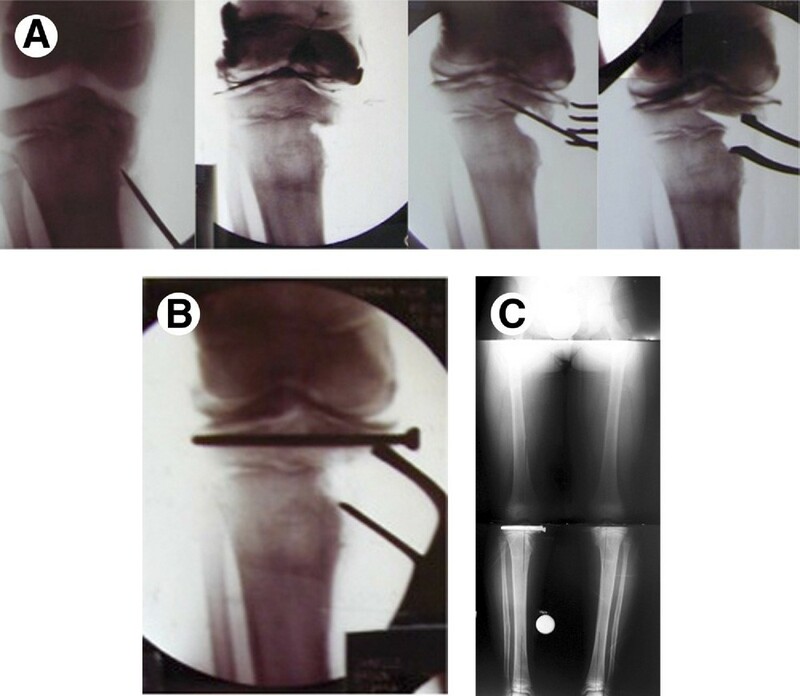 Extra-articular metaphyseal osteotomy for correction of the extra-articular deformity of varus and flexion, for correction of the internal rotation of the tibia, and for lengthening of the leg. 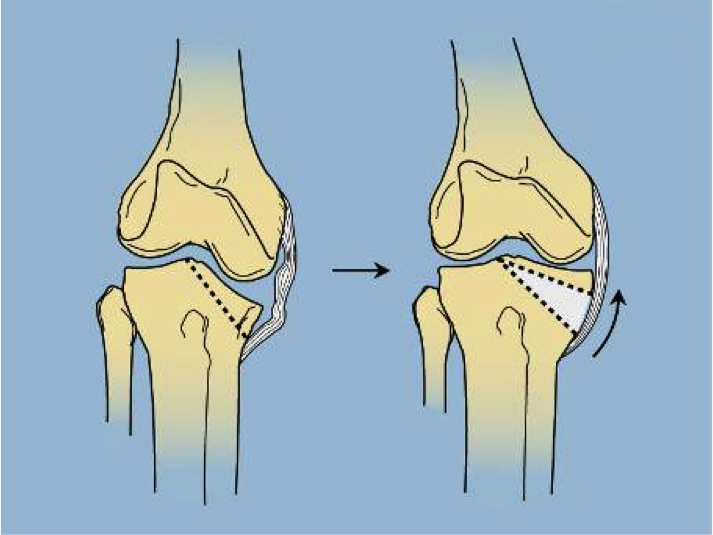 Differential lengthening of the tibia and fibula in order to re-tension the lateral collateral ligament. Hemi-epiphysiodesis of the medial distal femur to correct the valgus deformity versus varus osteotomy of the distal femur with internal fixation to achieve the same. Schematic of a hemi-plateau elevation osteotomy to correct "pagoda tibia"
There is no other center to our knowledge that applies this entire cascade of correction to address the entire array of deformities that the Blount’s Disease may present. Obviously, in less severe cases, a simple valgus osteotomy with external rotation of the upper tibia is performed.